Be able to find and store everything you need in your garage. With these smart and easy garage organization ideas, you’ll finally have enough room to fit your car. With a little time and elbow grease, you can have a garage that fits your car, your bikes and everything else you need to store too. Follow these garage organization tips – some of them are so genius you’ll wonder how you survived without them. This Old House states, “Organizing pros estimate that only 30 percent of us store our cars in the garage.” That is not surprising. There is a reason a garage gets so full that you can’t fit your car. It’s that “out of sight, out of mind” thing. Since you don’t live in the garage, it’s less likely to be organized and lots easier to fill up with everything that doesn’t have a storage solution. But just like everything else in your home, you will feel so much more amazing when you have an organized garage. So spend some time organizing your garage with these genius ideas. You’ll be so glad you did the moment you drive your car and park it where it belongs. The first step in every organizing project is to go through everything. If your garage is overrun with so much stuff that you can’t find anything, then it is time to throw away anything broken and give away anything you won’t use. Chances are, you just never took the time to make these decisions. Once you do, you’ll have a lot less stuff to store and it will be easier to find places for them. You might need to dedicate an entire weekend to this garage organization project. If you have a ton of stuff, lay out 3 different tarps: Keep, Give Away, Trash. What should you store in the garage? Tools – Sort and organize your tools so you aren’t keeping multiples of the same thing. Keep your tools together in the garage so they are ready to be used. Sports Equipment – These things tend to get muddy and dirty, so keeping them in the garage makes sense. Create a dedicated space just for all the sports equipment. Out of Season Clothes – If you must store your clothes in the garage, be careful to keep them in a sealed tub or bin. This will protect them from insects. Seasonal / Holiday Decorations – Be sure to keep your outdoor decorations separate from the indoor ones so they are easier to find. Car Necessities – This is logical since you store your car in the garage. It just makes sense to keep the car tools and cleaning supplies nearby too. There are some things that people keep in the garage that they really shouldn’t. Paint – Extreme heat or cold can ruin it. It needs to be stored in a temperature controlled environment. Propane – Since this is flammable, it should always be kept outdoors, away from the house. Anything Made of Paper – Roaches and bugs love eating the paper and laying their eggs here. Store them inside the house. Pet Food – This will attract rodents. If you have to keep it in the garage, store it in a tightly sealed bin or tub. One of the most common problems in garages is the sheer amount of things people keep because it could be useful someday. If you have room to store them, then keep that stuff. But if you are short on space, give it away. Keep just enough supplies and unfinished projects for things you know you can complete in the next year. 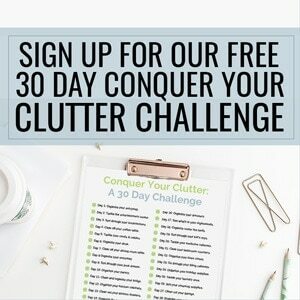 If you keep more than that, you’ll feel overwhelmed easier and that feeling will lead to more disorganization. The secret to an organized garage is to find “dead space” and use it wisely. The ceiling is often overlooked as a useful place to store things. Other people use the ceiling to hang up their bikes. There are lots of tools out there that will hold the bike up without any issues. When you create your own shelves that suspend from the garage ceiling, you can customize it to fit exactly what you need. Follow this handy garage shelves tutorial for the entire process. When you hang up things, they are out of the way and there is more floor space to walk around and actually work on your projects. The goal of the garage organization is to have it so well organized that when you walk in, you know exactly where everything is. So the next tip that is extremely easy to do, is to organize your garage into sections. Store everything by the type. Let’s look at the most common sections – or zones – to create in your garage. Establish a corner or even a section of shelves that will be dedicated only for seasonal clothes. Since these will be stored in tubs, you will want to create a more vertical space for this. Instead of having toys all over the garage, keep all of them along one wall or in one corner. Once you have a kids’ toys zone, ask your kids to always return the toys to this spot. Every home needs a dedicated DIY or fix-it area. This is the place where all the tools belong. If you have the space, create a work table. Hang up bigger tools on the wall by using a peg board. Finally, keep all your car supplies in another zone. You could keep the car tools near the tools section. Just make sure you know where to find it when you need it. As you dedicate areas of the garage for each type of activity, also impose a limit on the amount of things you can store in that area. As soon as it starts to be too difficult to store it all, go through it and only keep what fits. Another genius tip for garage organization is one that should be used in every single garage – wire shelving. Garages are where you store boxes, tools and things that you don’t keep inside your house. So you need shelves that will be durable. There are lots of types of wire shelving that you can choose from. Choose the floating shelves if you have larger things to store on the ground. You can install wire shelves higher up, near the ceiling, and free up ground space. Floating wire shelves are also incredibly helpful for storing out-of-season-sports equipment above the current season’s stuff. For example, hang up the bats, balls and gloves on the wall. Store the hockey equipment in the shelf above it. Pick floor to ceiling shelves if you have lots of containers to keep organized. Floor to ceiling shelves can hold a lot of tubs and boxes. So this storage solution is great for holiday decorations and out of season clothes. No matter which kind you choose, this garage organization tip shouldn’t be optional. You need shelves to store everything you are organizing. The next tip is important for any space where you need to maximize your storage area. Use a curtain or closet rod to hang up things like coats, spray paint, or even tools. Yup! By using a hanging organizer like our Clutter Keeper Deluxe Hanging Storage Organizer, you can organize just about anything and keep it within hand’s reach. With all the zippers and pouches, the uses are endless! And keeping it hanging up prevents everything in it from getting dirty or crumpled from stuff around it. Everyone knows that plastic storage bins are a much better idea than cardboard boxes, but how do you stack your tubs safely? Stacks of tubs can be treacherous if you just put them on top of each other. One bump and they could all crash to the ground (and on top of anyone or anything below). These DIY Storage towers from Family Handyman are super easy to build and they make your garage incredibly safer. The supplies are simple – ¾ inch plywood, paint, screws and sandpaper. If you don’t own a saw, you can always to have your wood cut the exact dimensions you need. After you make the storage towers, don’t forget to screw them to the wall. This will keep them from falling over. The next garage organization tip fixes the problem of wasting space with tools that fall over. Rakes, shovels and hoes don’t take up that much space in and of themselves. But when they fall over, there is a lot of wasted space they are taking up (and causing a tripping hazard too). In fact, once you start hanging things to the wall, you’ll realize that you have more things to hang up than you have walls. Honestly, since gardening and yard tools don’t fit well in boxes, they are the best idea to hang on the wall. Plus, they are used more often, so it helps to keep them somewhere easy to reach. After you decide what you are going to hang from the wall, decide on a technique. 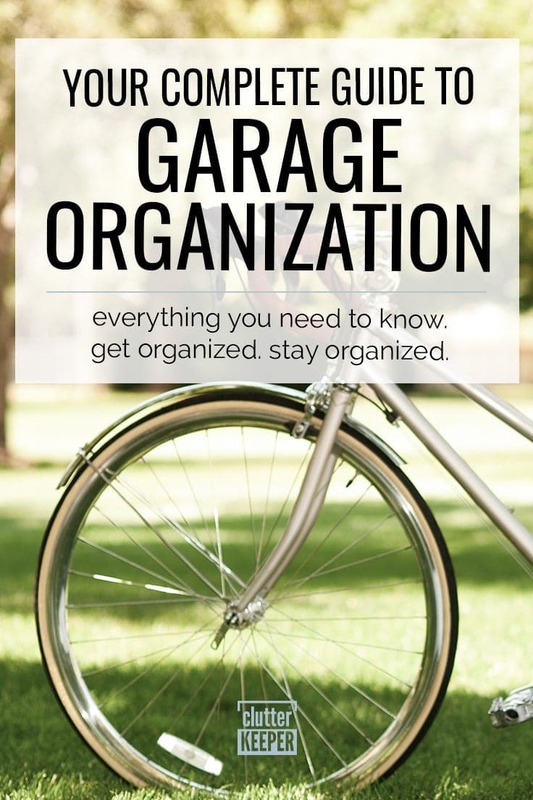 This method for garage organization gives you a lot of flexibility. 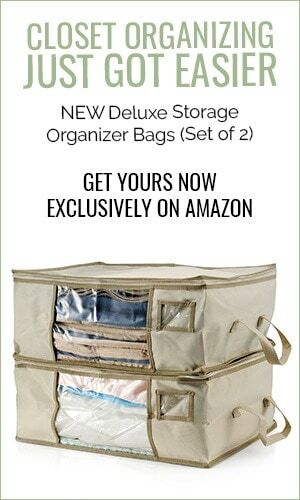 You can install small organizers or anything else you need to hang. Here is a visual of how nice and useful slat boards are on the garage wall. Another popular garage organization option is to install peg board. This is just as useful and allows you to change what you hang on the wall very easily. This tip is super awesome if you have kids – find some used lockers and give each family member their own locker. They can keep loose things in it like bike helmets, snow boots, knee pads, or even sidewalk chalk. When each person has their own locker, personal items are easier to find, Their stuff doesn’t end up in piles, and you can keep the rest of the garage even more organized. Look on craigslist or at flea markets for used lockers. Sometimes schools get rid of lockers when they install new ones. The next garage organization tip is to separate tiny items into small containers. In fact, Ugly Duckling House has the best tool hack. They discovered that a package of screws fits perfectly inside a plastic Orbit gum container. There are lots of small plastic containers with lids. Find the ones that fit best in your garage organization system. Don’t forget to label them so you don’t waste time opening each one to find what you need. Cabinets in a garage require a lot more space than open shelves, so if you are going to install cabinets, make sure you have enough space. Why are cabinets better than open shelves in a garage? Finally, if you are looking for a place for your weights and exercise equipment, a corner of your garage will work great. You can make this as extensive or as minimal as you want. All you really need is a padded mat and room for weight training. There you have it! 11 of the most genius garage organization tips you’ll ever need. Get in there, get organizing, and finally park your car where it belongs. After you tackle the garage, read more of our other home organization guides. These will walk you through every step so you can have an organized home that saves you time and money. Bathroom Organization – Completely organize your entire bathroom with this easy guide. Home Office Organization – Finally have an organized space that increases your efficency and focus. We’re so glad you found these tips helpful! Good luck with your garage organization project. 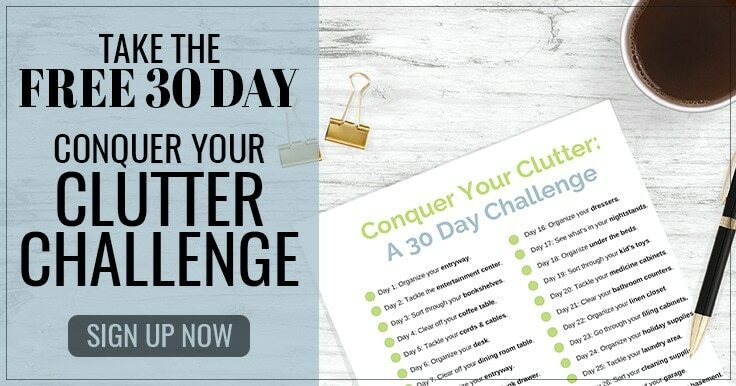 We know it seems daunting at first, but just take it step-by-step and you’ll be amazed once you’re done!